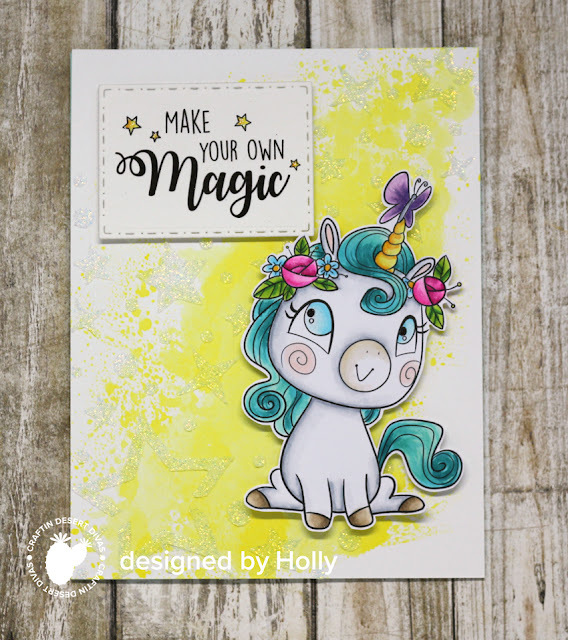 Hollybeary Creations : Craftin Desert Diva's Creative Challenge "Let's get coloring"
Craftin Desert Diva's Creative Challenge "Let's get coloring"
It's time for a new Creative Challenge over at Craftin Desert Divas... This week it's all about Coloring! The team is sharing some great tips on coloring images and sharing lots of great colored inspiration. 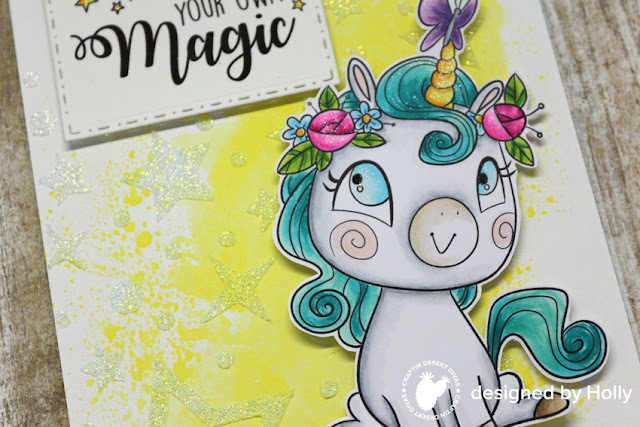 For my project, I'm using the Adorable Believe in Magic Digital Stamp, Star Galaxy Stencil, and the Fancy Frames Die set. I created an A2 size card base and then I added some Squeezed Lemonade Distress Ink to a piece of watercolor paper. Once that was dry I added some stars with the Star Galaxy Stencil and some Clear Glitter Paste. I set the panel aside to dry while I worked on my image. I create a card size rectangle in a word program on my computer and then I size my images and sentiments to fit how I want them on the actual card then I print the sheet out, color the images and cut them out with my scissors or my Scan n' Cut. Today's challenge is all about coloring so I wanted a Fun image with lots of parts too color. I colored the unicorn image in with Copics and then I added some Clear Wink of Stella to parts of the image for Sparkle. My coloring tip is... use a color wheel or a color chart so you can see what colors are similar and complement each other. A color chart also helps you see what colors you can use together that you wouldn't normally reach for. Head over to the Craftin Desert Divas Blog for more great inspiration from the team and lots of great tips. Then head over to the Craftin Desert Divas Gallery on Facebook and let us know what tips you found useful and share your coloring tips! How super cute is this card ! !